Although he died centuries before the invention of the cinema, the impact of William Shakespeare on the most popular art-form of the twentieth century has been profound. There have been many adaptations of his plays, but Shakespeare’s influence goes much further than simply adapting his works: his plays have been a source of inspiration for filmmakers in a number of ways and references to Shakespeare and his plays crop up in a variety of unexpected moments. The titles of two films by Alfred Hitchcock are drawn from Shakespeare (Rich and Strange (The Tempest) and North by Northwest (Hamlet)). The St. Crispin’s Day speech from Henry V has also been used as the source of the title for the HBO/BBC World War Two Series Band of Brothers (2001), and also features in Tombstone (1993). The two most commonly referenced speeches are from Richard II and Hamlet, and both have been employed in the contexts of British and American cinema, respectively, to articulate ideas about national identity. In the history of British cinema, it is John of Gaunt’s speech from Richard II (Act 2, Scene 1) that has been a source of inspiration for filmmakers. Several films have taken their titles from this speech, mostly produced during World War II: This England (1923 & 1941), The Demi Paradise (1943), This Happy Breed (1944). More than any other moment in the history of drama, it is John of Gaunt’s evocation of that has captured the image and imagination of the nation. Perhaps the most famous performance of this speech on film is that of Leslie Howard in The Scarlet Pimpernel (1934). To secure the escape of Lady Blakeney, Sir Percy surrenders himself to Chauvelin and as the firing squad is readied he reflects on the England he is leaving behind. Soft in focus and long in take, Howard’s performance of this speech adds a third dimension to the foppish Blakeney and the cunning Pimpernel and is very much the best scene in the film. This scene, perhaps more than any other in pre-war British cinema, establish the qualities of the English gentleman that also feature in films such as The Drum (1938), The Four Feathers (1939), Sanders of the River (1935), and the like; and does so with greater economy and far less bombast than in these other films. Since Britannia Hospital, the speech has disappeared from British cinema screens; while Richard II has tended to disappear from school curricula, which seem to focus almost exclusively on Hamlet and Romeo and Juliet. It seems unlikely now that audiences would be familiar enough with Richard II for a scene like that at the end of The Scarlet Pimpernel to work with the same power. It should also be noted that Muriel Box directed a film called This Other Eden (1959), about a town in Ireland that wants to erect a statue to a member of the IRA. Apparently, this was the first Irish film to be directed by a woman. Cork University Press published a monograph on this film in 2001 by Fidelma Farley as part of its Ireland into Film series. I have not seen this film, but the title is very suggestive of the political relationship between the British and the Irish. Hamlet’s ‘To be or not to be’ soliloquy (Act 3, Scene 1) has been referenced by Hollywood cinema on many occasions. The titles of numerous films have been drawn from the text: To Be or Not to Be (1942 & 1983), What Dreams May Come (1998), and even Star Trek VI: The Undiscovered Country (1991). While the Lubitsch’s and Johnson’s To Be or Not to Bes are comic farces, the other two films both share a sense of crossing over into the unknown (death and the afterlife, or a peace treaty with your mortal enemies). Star Trek VI was released in after the fall of the Berlin Wall, and the peace treaty between the Klingons and the Federation mirrors this breaking down of a long-standing barrier. The frontier is the line of most rapid and effective Americanization. … the frontier promoted the formation of a composite nationality for the American people. The coast was predominantly English, but the later tides of continental immigration flowed across the free lands. … The growth of nationalism and the evolution of American political institutions were dependent on the advance of the frontier ( 1956: 1-2, 10-11). The frontier is a place of becoming – it is where America became America, and it is this sense of becoming that occupies Hamlet. Faced with the murder of his father he must come to terms with himself and decide what he will do. This is Hamlet’s moment of becoming, of transformation, of crossing the frontier into adulthood and the future. And, by opposing, end them. Is not Wyatt in a kind of ‘sleep?’ Holliday in a nightmare? Clementine in a kind of dream? I generally think that Gallagher’s book on Ford is quite an interesting one, but this is rubbish. He simply assigns qualities referred to in the speech to characters in the film, and generates no insight whatsoever. The use of Hamlet in this scene may be interpreted in several ways. The placing of high culture in the low surroundings of a saloon does contrast the civilised and the barbaric. The film has, along with just about every other western, been interpreted as a shift from wilderness to garden, from barbarity to civilisation, and so we can see this as an instance of the becoming of the west. Hamlet is a metaphor for the transformation of American society at the frontier. At the same time, we have Doc Holliday who finishes the speech when the actor falters, and so we may this speech as a meditation on Doc’s mortality. Like Hamlet, Doc must face up to the future and determine a course of action. He must decide if he is to go on as a drunkard and a gambler, or if he will take a stand for what is right. The coughing fit that ends his performance reminds us of the short time he has left, and so his decision must be interpreted in terms of his own impending frontier – death. We would not expect to find Shakespeare in a western – it is certainly not a common part of the genre, but in My Darling Clementine it is one of the most important. This scene is a moment of pause, in which we are invited to reflect on the central question Shakespeare poses – ‘To be or not be’ – and to consider the nature and consequences of that becoming. For the west it is the transformation of the wilderness into civilisation, for America it is the becoming of a nation, and for Doc it is a decision on a path to righteousness. Gallagher, T. (1986) John Ford: The Man and His Films. Berkeley, CA: University of California Press. Turner, F. J. ( 1956) The significance of the frontier in American history, in G. R. Taylor (ed.) The Turner Thesis Concerning the Role of the Frontier in American History. Boston: D.C. Heath & Co.: 1-18. The existence of an area of free land, its continuous recession, and the advance of American settlement westward, explain American development. … The frontier is the line of most rapid and effective Americanization. … the frontier promoted the formation of a composite nationality for the American people. The coast was predominantly English, but the later tides of continental immigration flowed across the free lands. … The growth of nationalism and the evolution of American political institutions were dependent on the advance of the frontier ( 1956: 1-2, 10-11). It was no accident that the renaissance of the cowboy film took place during and immediately after World War II. And as America girds herself against the possibility of another great struggle, it is not surprising that the frequency of these films which reflect and nourish herself as successful defender of high ideals, has been stepped up (1953: 190). Richard Slotkin has noted that, ‘the beginning of the Cold War in 1948 inaugurated the Golden Age of the Western: a 25-year period, regularly punctuated by the appearance of remarkable films, that saw the genre achieve its greatest popularity and that ended with its virtual disappearance from the genre map’ (1992: 347). During the Cold War, a number of Westerns took on the Russian threat directly. Edward Ludwig’s The Fabulous Texan (1947) was dedicated to the “war weary and liberty loving people” of Texas who had fought against a corrupt government that was clearly intended to be regard as synonymous with that which threatened the United States. Two Confederate soldiers returning home after the Civil War discover that their town has become a police state under the control of a demagogic attorney general. One citizen describes this state as “the land of your birth is becoming a Siberia.” In The Bells of Coronado (1952) Roy Rogers and Trigger foil a plot to sell the United States’ Uranium supplies to an unnamed foreign power. California Conquest (1952), apparently based on real events, tells of an attempt by Russia to take control of California. Uniquely this film reverses the Western genre by forcing the Americans to feel invaded as they have expanded westward. No longer is the white man taking over the Indian lands, but is fighting to preserve the frontier against the “old” world. Man Behind the Gun (1953) and Pony Express (1953) also deal with attempts to separate California from the Union that are defeated in order to maintain the integrity of the nation. Cripple Creek (1952) has federal agents revealing a conspiracy to hand gold reserves to the Chinese. Significantly in the cold-war Western it is the institutions of American democracy that secure the frontier and the nation. The federal government, so often projected as at odds with the individualistic frontiersman in the Western, is situated as the hero, as what links the west with the east thereby creating the nation. 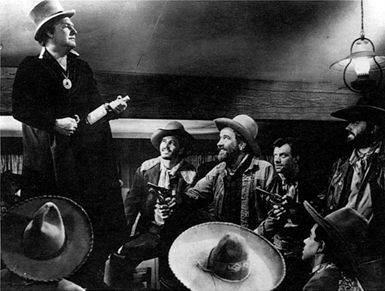 John Ford’s Rio Grande (1950) takes up the theme of Turner’s thesis and directly concerns itself with the role of institutions in the west. The film presents a discourse on nationalism, on sacrifice and unity, and on the proper authority within the United States to make foreign policy decisions, and asserts that it is at the frontier of the Rio Grande that the family and the U.S. military finds their meaning. The family is integral to Rio Grande and the film asserts that families must make many sacrifices in order for the nation to be victorious. The corporal, for example, is not allowed to mourn for his murdered wife but must carry on with his duties, whilst the success of U.S. military policy comes with the rescue of the children and the reintegration of the family. Even murder is excused in the name of the family, as Tyree justifies killing a man for the honour of his sister. The centrality of the family is played out through the Yorkes, whose reintegration comes with the acceptance of national goals. Colonel Yorke’s estranged wife Kathleen arrives at the fort in order to buy their son out of the U.S. Cavalry. She has already had to pay a heavy price for the nation when as a southern landowner her husband, on General Sheridan’s orders, razed her home and lands to the ground during the civil war. Now she intends to reclaim her son from the Union army but is soon won over by becoming part of the family of the U.S. Cavalry thereby entering into the nation. Arriving at the fort Kathleen is shown to be clinging on to her identity as a provincial, dressing as and demonstrating the manners of a southern belle. She repeatedly declaims “Yankee justice” and blames the army for her predicament. She soon sheds these traits becoming a washerwoman at the fort although she is a colonel’s wife, even taking on the laundry of the junior ranks. At the close of the film Kathleen stands at the entrance to the fort like the other women waiting for the return of her son and her husband from their mission beyond the Rio Grande. In taking the Colonel’s hand and joining the march into the fort she signifies her acceptance of cavalry life and thus the reintegration of the family comes with the acceptance of military needs. The timeliness of Rio Grande, adapted from an earlier story by James Warner Bellah, is apparent in the attacks on diplomacy and the State Department, which in 1950 were under constant assault during the Korean War. In 1945 Soviet and American troops occupied Korea, dividing control along the 38th parallel. An arbitrary boundary and originally intended to be temporary, the line became an international frontier in the struggle between Communism and the West. On 24 June 1950 the Soviet backed North Korean army launched a full-scale offensive across the 38th parallel. President Truman committed American naval, air and ground forces to assist the south that dominated the United Nations force led by General Douglas MacArthur. The Korean War initiated a new type of conflict in the nuclear age: limited warfare. Limited warfare has defined local aims, in this case to drive the Communists out of South Korea, and has no goal of total destruction of the enemy. Truman came under increasing criticism during the Korean War for his use of limited combat, which even his Pacific Commander-in-Chief MacArthur denounced as the ‘appeasement of communism.’ In the face of the detonation of the first Soviet atomic bomb, the Communist victory in China, and the Alger Hiss case Truman never looked more than soft on Communism. Limited warfare was hard to swallow for the American people who, in their short experience of global warfare, had achieved little below the total destruction of the enemy, and had developed a taste for the “all-or-nothing” victory. This approach to foreign policy, John W. Spanier states, is ‘nowhere more appropriately revealed than in that uniquely American genre, the Western. … In his consuming passion for justice and morality, the cowboy pursues the outlaw and “shoots him dead.” This is typical of the American approach to war once the nation has been provoked: shoot the enemy dead and thereby solve the problem. Moreover, the enemy is evil and his death is therefore socially beneficial and morally justified’ (1965: 6). In dramatizing the Korean conflict as a Western Ford replicated the situation of Untied Nation’s forces, overwhelmingly dominated by the U.S. military, of facing a clearly defined enemy (The North Korean Army/the Indians) across a clearly defined frontier (the 38th Parallel/the Rio Grande). Ford also replicated MacArthur’s frustration with limited warfare through presenting the frustration of Colonel Yorke with the State Department. Rio Grande opens with Yorke returning to the fort having been forced by diplomatic restrictions to halt his pursuit of the Indians at the Rio Grande. Sheridan reminds Yorke that “That’s the policy and soldiers don’t make policy, they merely carry it out.” It is the State Department, the bureaucrats isolated in the East, which ties the hands of the Indian fighters unaware of the nature of the war at the Rio Grande. Ford’s film questions the fitness of such men to make policy decisions whose notion of limited warfare is at once self-defeating as the Indians escape with ease and un-American as it goes against the “all-or-nothing” codes of the Western. Success for the cavalry is forthcoming but only once Sheridan defies his stated orders, criminally overriding the federal government and his own Commander-in-Chief, and orders Yorke to cross the Rio Grande. This extreme act is rationalized with the knowledge that three tribes have united against their common enemy and the siege mentality of the cavalry troop is a figuring of the America’s response to the united nations of international communism. Sheridan’s words reveal his exasperation with Washington: “I want you to cross the Rio Grande, hit the Apache and burn him out; I’m tired of hit and run, I’m sick of diplomatic hide and seek.” The move from limited warfare to the “all-or-nothing” code of the Western is presented as the reason for Yorke’s success and projected into the realm of public debate on the Korean War, which was largely in favour of totally destroying the enemy, it supports MacArthur’s calls for a more aggressive foreign policy. Rio Grande presents Sheridan and Yorke as the proper authority to make policy decisions in times of crisis and here taps into an important post-Civil War strain in progressive ideology was the “military metaphor,” which saw in military organization a possible model for good government. General Ulysses S. Grant was elected to the office of President, and it is a notable feature of American history that in times of crisis a General is made Commander-in-Chief, the clearest examples beside Grant being Washington and Eisenhower. It is this type of demagogic military power that, following Eisenhower’s identification of the “military-industrial complex,” becomes the focus of American cinema as the nation comes to realize the dangers of an all-powerful military bent on victory at any cost. As a genre and a history familiar to American audiences the Western allowed for a rationalization of events that would otherwise have disturbed the United States. Rio Grande, for example, presented the “military metaphor” of government, necessarily surrendering the principles of democracy, in terms of a war fought and won by the United States, and in doing so attempted to prove the worth of military government. This “military metaphor” is also evident in Springfield Rifle (1952), where the military leadership is frustrated by political considerations in the Union’s war against the south. The film opens in the War Office in Washington where General Halleck explains to Colonel Sharpe that the politicians do not feel that it is proper for a nation’s army to be involved in espionage. Sharpe rebukes this view strongly: “The only answer to their espionage is an espionage system of our own.” Springfield Rifle thus portrays the political leadership of the United States as being unaware of the true threat from an enemy who would undermine the nation. The hero of the film is Gary Cooper, who plays Major Lex Kearny, a spy for the Union who infiltrates a gang that is stealing horses during the Civil War. The future of the nation rests with men like Sharpe and Kearny who are prepared to use subversion and murder in order to destroy the nation. Kearny goes to extreme lengths to fight the covert war against the horse rustlers and in one sequence maneuvers a member of the gang into a position where a fellow agent can kill him. Springfield Rifle rationalizes the need for a counter-espionage program against the Soviets such as the FBI’s COINTELPRO (Counter-Intelligence Program) and the un-constitutional lengths to which the nation must be prepared to go through replaying previous victories that are vital in the history of the construction of the nation. In films such as Uncommon Valour (1983), Missing in Action (1984), Heated Vengeance (1985), Rambo: First Blood Part II, and Braddock: Missing in Action III (1988) the attempt is made to demonstrate that America did not “lose” Vietnam through depicting a Vietnam War that did not end with the fall of Saigon in 1975 but one that has continued to the present day and which must be fought by men such as Braddock and John Rambo. These films are the descendants of John Ford’s Rio Grande in that they depict men of action disregarding the empty words of diplomats in order to return to South East Asia and ‘win’ the war. In Missing in Action, the narrative concerns the attempts of Braddock, a veteran, in rescuing American prisoners of war from Vietnam. The government in Ho Chi Minh City denies that any American soldiers continue to be held and the American diplomats take this at face value. This is not good enough for the veteran, and Braddock having spent many years in a POW camp himself possesses a realm of knowledge, an experience of having “been there,” that is inaccessible to those who spent the war safely in Washington. Braddock decides to go back to Vietnam in order to release the POWs and his decision to bypass the ineffectual structures of diplomacy, strongly reminiscent of Colonel Yorke’s attitude towards the State Department during the Indian Wars, draws the conclusion from one official that he is the “most undiplomatic man” she has ever met. Braddock’s lack of diplomacy, like Yorke’s, is what allows him to succeed as he refights the war, this time with a much more satisfactory, and perhaps more Hollywood ending. Jackson, H. L. (1953) Cowboy, pioneer and American soldier, Sight and Sound 22 (4): 189-190. Saunders, F. S. (1999) Who Paid the Piper? The CIA and the Cultural Cold War. London: Granta. Slotkin, R. (1992) Gunfighter Nation: The Myth of the Frontier in Twentieth-Century America. New York: Atheneum. Spanier, J. W. (1965) The Truman-MacArthur Controversy and the Korean War (New York: W.W. Norton & Co.